Can Hong Kong Become a Bike Friendly City? Across the globe, cities like New York, London and Singapore have developed bike-friendly policies and introduced bike-sharing systems to encourage the usage of cycling as an alternative eco-friendly mode of transportation. Hong Kong, with one of the most developed transport network in the world, fall far behind from those cities. Cycling has been perceived as a weekend entertainment more than a transportation mode owing to the unfriendly road design and government policies. Not long ago, the newly launched Gobee.bike sharing app has a bumpy start with damaged rides and security fears. Meanwhile, attempts of extending bike lanes across New Territories are also halted due to the high construction cost. Yet, is it really impossible for Hong Kong to become a bike friendly city? Despite the term of ‘bicycle friendly environment’ has been mentioned in the Policy Address 2016 for the first time, the role of cycling is still only be regarded as a recreational activity in Hong Kong. According to the Transportation Department’s Travel Characteristics Survey 2011, only 20% of the cycling trips connected with other public transportation while the rest were “cycling-only”. Meanwhile, most “cycling trips” are found in new towns like Fanling, Sheung Shui, Yuen Long, Tai Po, Sha Tin and Tuen Mun where most biking facilities and tracks were found. Dr. Barber believes convenient transportation lowers the incentive to bike. Apart from the city’s extreme density, hilly topography and unpleasant weather, highly connected public transportation also contribute to such perception. 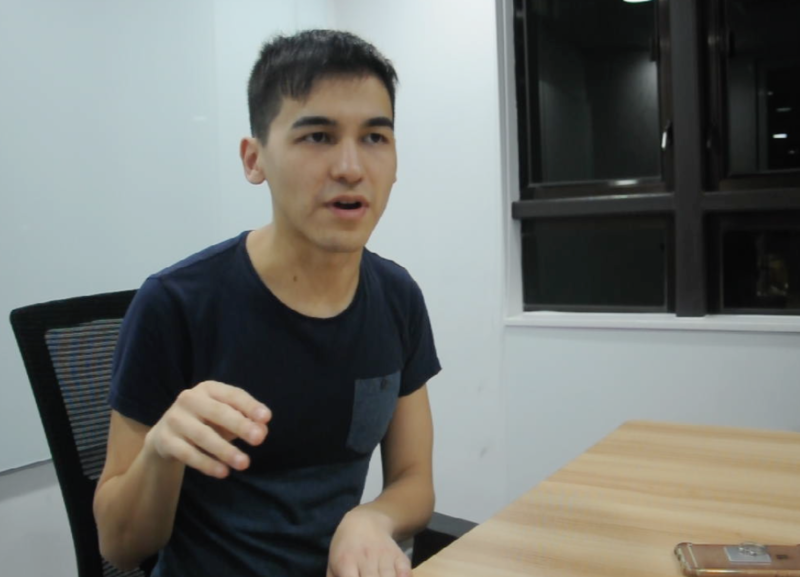 “Hong Kong has a really really excellent public transportation system and ninety percent of people don't own private cars to get around so if other modes are so convenient then why change anything. That hinders the possibility of promoting cycling in a rigorous way,” said Dr. Lachlan Barber, an assistant professor of Geography at Hong Kong Baptist University. Such view on the use of bicycle comes down to policy and thus hindered any further bike-friendly infrastructure projects in many new towns where bicycle use is still prominent. Although various studies have been conducted by the government, the development of cycling has not been well incorporated in Hong Kong’s transportation policies and mainly found in the New Territories and rural area. The “Third Comprehensive Transport Study”, which conducted by the Transportation Department in 1999, did not encourage cycling as an alternative transport mode. Provision of cycling tracks was only suggested to be planned in the new towns, where spaces and traffic conditions are allowed to form a “vehicle-segregated and interlinked system”. The “Cycling Study”, which conducted in 2003 to identify the role of cycling in Hong Kong, once again emphasised that cycle tracks should still be implemented in the new towns. It was only until the “HK2030+ Study”, the government started to consider cycling can be an interconnection transportation for the railway to improve the environmental quality and build up a green city. Yet, recommendations like developing new cycle track network, improving existing bicycle facilities and strengthening road safety education from these studies have not been carried out thoroughly. Meanwhile, cycling in the urban area is particularly discouraged by the government. Secretary for Transport and Housing, Professor Anthony Cheung Bing-leung once said in the legislative council that “ Hong Kong's road traffic is heavy with carriageways and footpaths so congested that it is difficult to spare spaces for developing tracks designated for cycling” and “due to safety consideration, the government does not encourage the public to use bicycle as a transport mode in urban areas”. “I think that it's partly true. But a really important follow-up question is what do you do with a situation like this? I think you can respond by trying to make it safer instead of suggesting that people are comfortable with the status quo and there is no reason to change,” Dr. Barber said. Hong Kong road planning and standards were adopted from overseas through colonial governance between 1950s-1970s, according to Dr. Barber. “It was a time when cars were really kind of the future in most developing and modernizing cities, so streets are designed for cars to be used efficiently. “New towns in the New Territories were developed according to the New Town Planning principles to create total self-contained communities that have everything people might need in their daily life ”, said Dr. Barber, “so cycling tracks and roads were built at the same time as the towns were developed. Yet, the low connectivity between cycling tracks has long been blamed for hindering a bicycle-friendly environment. From the map below, it shows how existing bike lanes and available parking lots mainly locate within the scope of New Towns. “The government perception of cycling infrastructure as something that needs to be highly segregated from traffic is an outdated idea,” said Ben MacLeod, an urban designer. He observes that there’s a trend of more and more newly constructed roads resemble like highways, fences divide sidewalks while the traffic and roads spare more than enough spaces for cars. threaten the road safety for cyclists”, said MacLeod. Given Hong Kong’s metro system efficiently moves people through the city, introducing bike lanes in Kowloon and Hong Kong Island would be a matter of need, but never a matter of technical capability, according to Dr. Barber. Hong Kong’s first bike-sharing service GoBee, an app-based bike-sharing system, has faced lots of difficulties since its launch on April 20 in Hong Kong. A Gobee bike was being thrown into the Shing Mun River. 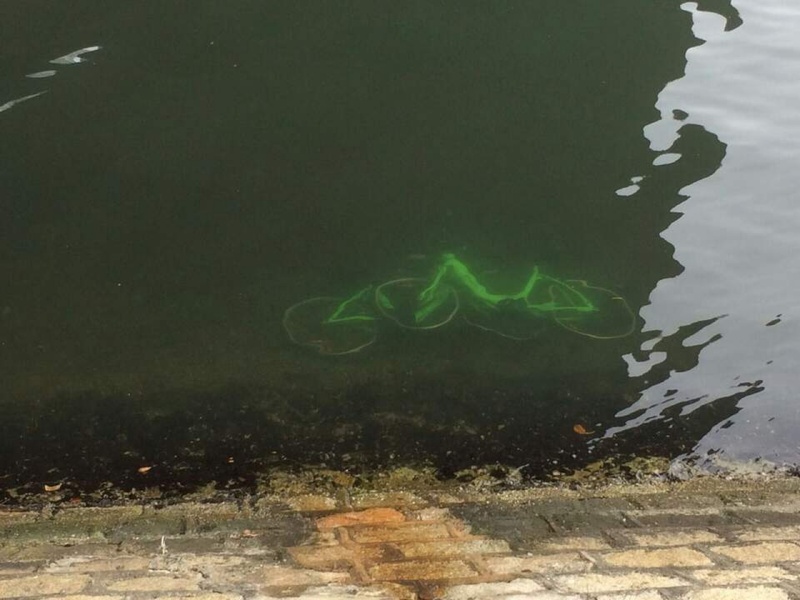 Apart from facing complaints from users about being overcharged, complicated deposit procedure and the app’s vulnerability to hackers, a total of nine bikes are found damaged or even tossed into the Shing Mun River. GoBee’s founder Raphael Cohen told HK01 that he was heartbroken about the incidents. Cohen, who had been living in Hong Kong for nearly six years, said “I just don’t feel safe in the city anymore”. In regard of illegally occupying public parking slots, Cohen told Unwire that he already consulted multiple related departments, including Transportation Department, Lands Department, Hong Kong Police Force, Leisure and Cultural Services Department, etc. He believes that they are supportive of his company bike-sharing service. Yet, the government has long been reluctant in introducing the bike-sharing system in Hong Kong despite the pilot self-service bicycle rental scheme at the waterfront promenade in the West Kowloon Cultural District. In a written reply to the Legislative Council, Professor Cheung stated that “the existing private rental services can already meet the current market demand, so there is no need for a public rental system”. Lawmaker Edward Yiu Chung-yim said he disagreed with Cheung’s statement. “There’s a great demand for an alternative interconnected transportation mode between railway stations to a certain area. For instance, people who now need to queue up for connecting buses to Science Park and Ma On Shan from University Station to work would be happy to bike if such option is available ”, said Yiu. Yiu also said Gobee could have a smoother launch if the government was willing to learn from Taipei government approach and change a certain number of street parking space into fixed bike parking lots. “Imagine just give up one parking lot can have 10 bike parking lots in return without sacrificing any public space or violation of law,” said Yiu. Yiu said it can even give a clear message to private car owner to use bike instead. More than 200 cities consider cycling as a part of a critical and powerful movement in public transportation. Taiwan's YouBike sharing service, which is regarded as one of the best bike-sharing schemes in Asia, achieved a 40 million trips since 2009 in March. A quarter of all trips in the Amsterdam is made by bicycle while in Copenhagen 50 per cent of people cycle to work every day. In Canada, the war between cyclist and drivers was eased by the introduction of a law that a meter of space should be given to ensure the cyclists’ safety when cars pass cyclists. Bicycles even outsell new cars in almost every European city. “High density of land shouldn’t be an excuse for Hong Kong to develop into a bicycle-friendly city,” said Dr. Barber. “Some of these cities that people think of as the cycling mecca like Amsterdam, Portland, Montreal used to had an extremely stream lead text-justify dependent on cars. It was only until people started asking is this the kind of city that we want to have, the shift towards thinking about bicycles as a viable transportation mode began to happen,” said Dr. Barber. Dr. Barber also pointed out that New York, a bustling metropolis similar to Hong Kong, enjoys record levels of commuter cycling after introducing cycling networks in the dense urban area. Cycling produces zero emissions and noise when compared to other transportation modes. Air quality and carbon footprint of Hong Kong would be improved if the use of private cars is replaced by bicycle. 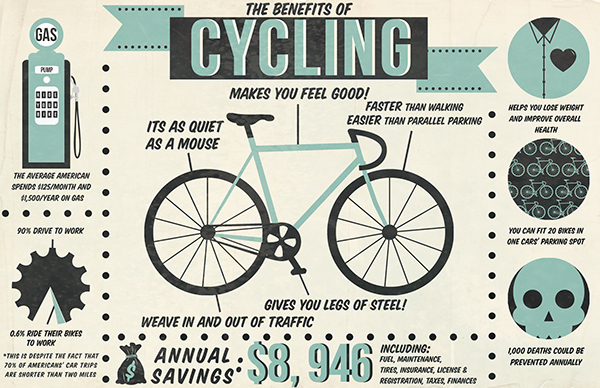 Bicycles require less space than private cars in terms of both car usage and parking. A car takes up 8 times more space than a bicycle on the road while space needed for parking a car is almost 20 times than that for a bicycle. Since land is a scarce resource in Hong Kong, bicycle tracks are indeed more space efficient and thus helps release more space for other purposes. According to the Hong Kong Department of Health, around 60 percent of Hong Kong’s population does not engage in adequate physical activity – defined by the WHO as 150 minutes per week of moderate-intensity aerobic activity and lead text-justifying to various chronic health issues. Regular cycling for 30 minutes each day can improve cyclists’ overall physical condition by reducing the risk of developing major chronic diseases like coronary and heart disease by up to 50% and the risk of premature death by about 20-30%. Cycling around a country has become a popular trend in tourism recently. Many countries like Taiwan, Germany, and Netherlands have successfully boost up the number of visitors by promoting cycling tourism through connecting tourist spots with bicycle tracks. Used to be a regular biker himself in Canada, Dr. Barber now seldom rides, safety is a great concern. Many echoed with Dr. Barber concern. According to the Transportation Department’s Travel Characteristics Survey 2011, overall respondents support the idea of enforcing stronger safety measures. Edward Yiu, Bike the Moment and Rideout had been launching “Tin Kwong Ride” (meaning dawn ride in Cantonese) for consecutively 22 weeks. It was a mass ride along the north of Hong Kong Island with an aim to tell the government the importance of introducing cycling-friendly policies. Lawmaker Edward Yiu and other activists have been actively promoting the idea of Tin Kwong Ride in HK. “Riding as a team of 100 also allows cyclists to ride in a relatively safe environment instead of being pushed aside. It successfully proved the feasibility of sparing a bike lane on roads,” said Yiu. the bicyle network because of high costs. Lawmaker Edward Yiu suggests a simple low-cost solution could be to apply pavement markings that separate carriageways and bike lanes, as other countries do. "We can use one of the side streets that runs north to south and has quite low traffic to begin with, dedicate one of those as a bike route, and then think about connectivity," added Dr. Barber. Regarding the new development area, Macleod thinks current practices are very engineering driven and do not allow urban design thinking. For example in Kai Tak development projects start with civil engineering development department. Also, public participation in the early stage of planning is found inadequate. “Sometimes modest changes with better urban design thinking will work, and do not need a detailed study of long term to plan and implement,” said MacLeod. For bike lanes, Macleod suggests that segregated cycle path could be the solution or bikes can go with the traffic, while fences encouraging faster driving trend should be out of phase. “In a city people relying on public transit so much, there should not be such a big priority for the car to move as fast as possible,” said MacLeod. Hong Kong as a whole, adopting cycling for commuting rather than merely for recreation, needs further studies and public education. “Paying and using public transport and that's not necessarily a bad thing but I think that active transport so either walking or cycling it's always nice to have that as a choice. If people don't have that as a choice then I think most of the spectrum for mobility is somewhat limited,” said Dr. Barber. “We need “a shift”. A shift in the thinking; a shift in the discourse and a shift in the culture that has sort of material manifestations in the laws and in the configuration of space,” said Dr. Barber.